At the start of each year, parents were sent a form asking them to write down their child’s religion among other enrolment details. If the parent wrote down a specific religion, the child was automatically enrolled in scripture classes for that religion (if available at the school). If the religion is not available or the parent wrote “no religion”, a letter is sent back explaining the religious education options or the fact that the parent may elect to not enrol their child in any religious class. If the parent at this stage chooses to enrol their child in a religious class, that happens. If they choose no religious class then they are sent another letter explaining that there are two options: “non-scripture” or ethics. If the parent chooses “non-scripture” or does not reply, the child is enrolled as “non-scripture” (which is merely a supervised free time in which no teaching instruction of any sort is given). Only if the parent chooses ethics at this time is the child enrolled in Ethics classes. But from 2019, thanks to pressure from support groups and supporters on both sides of politics, the procedure has been revised and simplified. From now on, at the start of the school year, parents will be sent a letter with check boxes for all of the available religious options, non-scripture, and Ethics. They will see all of the options up front and be able to choose Ethics immediately, even if they are raising their child in a religion but prefer to have Ethics education instead of religious education. New of this change has been reported on the NSW Department of Education website and by the Sydney Morning Herald. Oh! And in other news, I received this for my work in Ethics teaching this year! 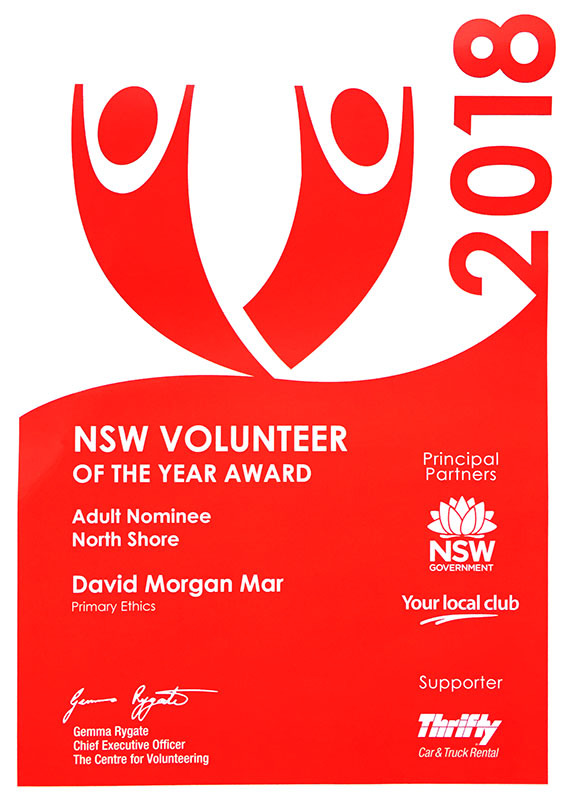 I’m not The Volunteer of the Year – this was just a nomination for the award in my region. But very nice to receive some recognition! My latest Primary Ethics lesson topic is about “Drugs in Sport”, which I just finished today after four weeks of lessons. The topic starts by considering what it fair and unfair in sports, and the general concept of cheating, It only really broaches the subject of performance enhancing drugs in the fourth and final lesson (today’s). It starts by considering caffeine. The kids are year 6, so roughly 11 years old, and most of them have some idea what caffeine is, what foods contain it, and what its effects on the body are. The course material has me tell the kids that caffeine is known to improve athletic performance, and then ask them if they think it would be fair for an athlete to drink a few cups of coffee before a race/game. They all pretty much thought this was fair. Then I mention that from the 1980s, the World Anti-Doping Authority banned high doses of caffeine in sports, with a level equivalent to 8 cups of coffee or more being illegal. However they reversed this ban in 2004 and now any caffeine level is legal. The curriculum has me ask the question: Why do you think they banned caffeine, and why do you think they removed the ban? How’s my Ethics teaching going? I’ve been teaching Primary Ethics for 5 school terms now (a term is a quarter year) since I began in April last year. In 2017 I taught the Year 4 class. I’d hoped to move to Year 5 in 2018 so that I could have many of the same children, but due to a wave of teacher retirements I was assigned Year 6 at the beginning of this year. Year 6 is the oldest kids at the primary school, so the most mature, around 11 years old. As one would expect, they generally have better concentration skills and are more interested in discussing the sorts of topics that we teach in the classes. So it’s been pretty good for the past two terms. What makes a fair society? What makes an unfair society? What are human rights? Where do they come from? Should animals have rights too? Fatalism: Is the future predestined, no matter what we choose to do? Does it matter what other people believe? Should we respect other people’s beliefs, even if we don’t agree with them, or if they are harmful? Determinism: Do we have free will, or are our choices determined by our circumstances? And if our choices are determined, are we responsible for our actions? Some of it is pretty heavy stuff for kids this age, but the curriculum is designed to introduce the topics in ways they can understand, and they’ve been enjoying it. David I keep meaning to tell you that my son (Year 4) when I told him I was taking your Year 6 class said “Mr Morgan’s class? Everyone wants him he’s the best Ethics teacher”. Needless to say: wow, cool! Clearly the Year 6 kids have been telling everyone how much they enjoy their classes with me. So I’m pretty chuffed! This morning I was setting up the school classroom for teaching my Primary Ethics class when one of the Year 4 boys in my class came up to me and asked, “Can you explain the photoelectric effect?” This is a nine or ten year old kid, remember. He has no way of knowing I have a Ph.D. in physics, and so yes, this is actually something I know about and can explain to people. I tried to tone it down to a nine-year-old’s level.